My take on this is that the Language of Nature is the existence of geometric figures and systems that is invisible to the untrained eye. The great book of nature is written in mathematical symbols. Philosophy is written in this grand book (Book of Nature) — I mean the universe— which stands continually open to our gaze, but it cannot be understood unless one first learns to comprehend the language in which it is written. It is written in the language of mathematics, and its characters are triangles, circles, and other geometric figures, without which it is humanly impossible to understand a single word of it; without these, one is wandering about in a dark labyrinth. This is Orffyreus hidden language! 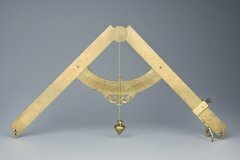 Galileo Galilei constructed the Military/Geometric Compass - He made a calculating device that preformed many geometrical and arithmetical operations. “It was possible to perform with the greatest of ease all sorts of arithmetical and geometric calculations, ranging from calculating interest to extracting square and cube roots, from drawing polygons to calculating areas and volumes, from measuring gauges to surveying a territory."